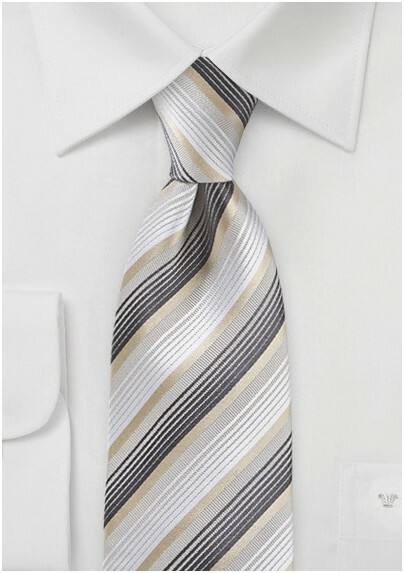 Take a modern and minimalistic approach with your color palette and fashion accessories by incorporating this handsomely striped tie in whites, golds and charcoals into your menswear wardrobe. 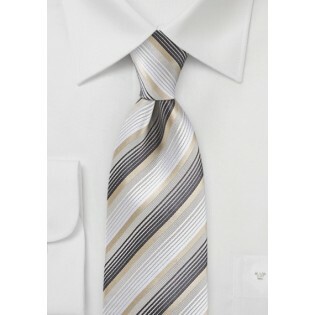 Look uber dapper by teaming this contemporary and graphic necktie with a tan and white gingham patterned dress shirt, a European tailored pin-striped suit in charcoal grey and classic black wingtips. Designed from high quality silk and designed by the Cavallieri Design Team.